I confess: I am a huge nerd when it comes to the Olympics. Over the last few weeks, I’ve been performing my every-two-yearly ritual of getting crazy excited, watching Olympic trials, and generally buying every magazine with pre-Olympics coverage that I can find. I cannot wait for the opening ceremonies tomorrow and for two solid weeks of nonstop Olympic coverage after that. 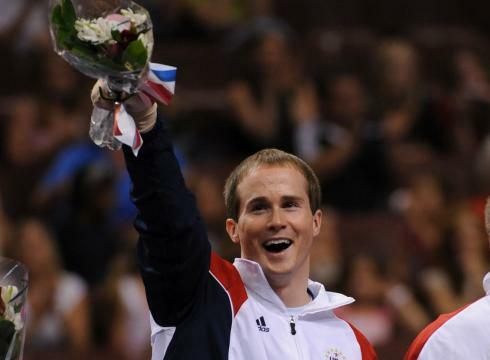 This may sound weird, but one reason I love the Olympics so much is because they make me cry. Think about it: is there any other event that blends once-in-a-lifetime high stakes, patriotism, hard work, personal (and familial) sacrifice, triumphant victory, and agonizing defeat together so poignantly? I would argue there is not, and that is why the Olympics are special. That’s also why they tend to make me weepy, but in the best possible way. In the “I’m so happy for these random strangers and their families, I love the USA, I believe dreams really do come true” kind of way. I cry because I’m moved, I’m inspired, and I’m proud. It’s a good kind of cry. People always talk about Super Bowl commercials, but for me, nothing beats the commercials during the Olympics. Some of my favorites over the years include the Home Depot commercials (consistently great from Olympiad to Olympiad; here’s a good example), the 2008 Visa commercials (you cannot go wrong with a Morgan Freeman voiceover), and this year’s Proctor & Gamble commercial. What is it about Olympic athletes and tragic pasts? It seems that each Games, there’s at least one (and usually several) athletes who overcome devastating personal tragedies to turn in amazing performances. 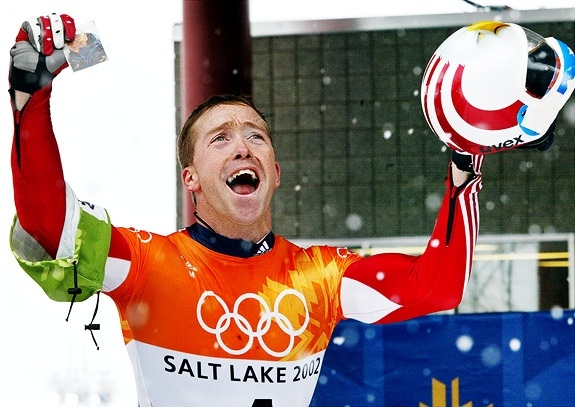 Some of my favorites include: Jimmy Shea winning gold in skeleton a few weeks after his grandfather (also a gold medalist) passed away, Joannie Rochette winning bronze days after her mother died, and Dan Jansen finally winning gold after struggling six years earlier in the wake of his sister’s death. Cliche though it may be, another thing I love about the Olympics is that sometimes the most amazing victories come in defeat. The fact is, most athletes won’t win a gold medal or any medal at all – but I would argue there’s something incredible about just being an Olympian, about competing, about sticking through to the bitter end, win or lose. And if you can watch Derek Redmond limping to the finish line with his father’s help without crying, then you are a stronger person than I. Or a robot. Seeing flags slowly raised into the air while the anthem plays is one of the iconic sites of the Olympics; it always gets to the athletes and it always gets to me. Some of my favorites? The historic 2002 pairs figure skating double gold medal ceremony and the Magnificent Seven on the podium in 1996. One reason NBC’s Olympic coverage is particularly excellent is because they tend to have announcers who are not only incredibly knowledgeable about their respective sports but who also know how to bring drama and passion to the proceedings. When an announcer starts to get choked up, I start to get choked up. 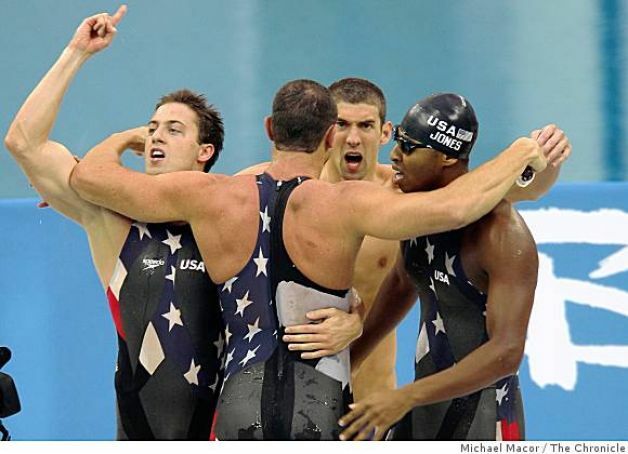 The obvious example here is the iconic “Do you believe in miracles?,” but I also love Scott Hamilton commenting on Sale and Pelletier (“A throw triple loop and the gold is theirs”), Rowdy Gaines going crazy for Michael Phelps (“He did it! He did it! One one-hundredth of a second!”), and Tim Daggett unable to contain his joy for Paul Hamm (“That for me was the greatest sporting moment I’ve ever seen, right there”). The reactions that athletes have the moment they realize they’ve won is always incredible – pure joy and amazement, and always guaranteed to make me start welling up (particularly if the cameras cut to family members in the audience who are also celebrating). My favorite reactions include: Sarah Hughes (and her coach) after her surprise gold in 2002, Misty May and Kerri Walsh’s exuberance after winning their second gold in 2008, Cathy Freeman overcome with emotion in 2000, and Roger Federer performing a silly magic routine after winning doubles gold in 2008. You know what almost everybody loves? An underdog. 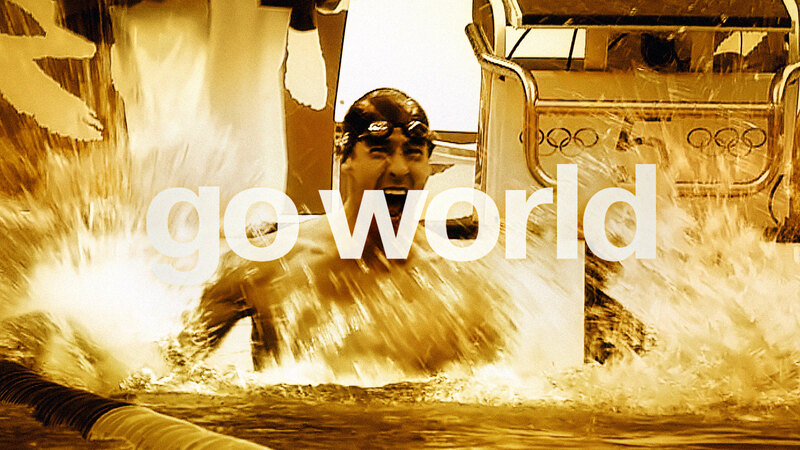 And at the Olympics, when someone comes from nowhere to win gold – or any medal really – it’s particularly compelling. 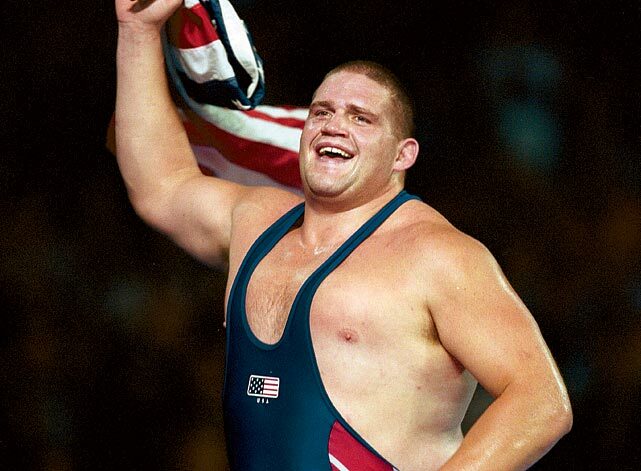 Two of my all-time favorite underdogs were Rulon Gardner in Greco-Roman wrestling and Laura Wilkinson in platform diving. So, so good. NBC engages in blatant emotional manipulation throughout the Olympic games and, you know what? I love it. The stories they do about athletes before the competition and the victory montages they do after the competition never fail to choke me up. NBC draws on a reliable stable of tricks – pensive shots of athletes gazing out windows as a poignant voiceover rolls, triumphant images scrolling across the screen to the sounds of R. Kelly’s “The World’s Greatest” – but why change the formula when it’s so damn good? 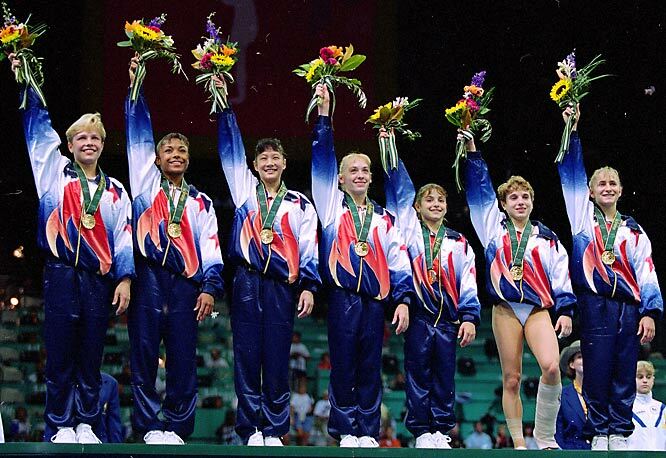 Some examples: the introduction to the 2004 women’s all-around competition, the opening video for the 2006 Olympics (chills), and the 2002 story on Sale and Pelletier. Perhaps more than anything else, for me the reason Olympics are so compelling is because you get a chance to see athletes do incredible, unbelievable, flat-out brilliant things. Strip away all the cameras, reporters, fans, and pomp and circumstance and what you’re left with are athletes competing at their prime. 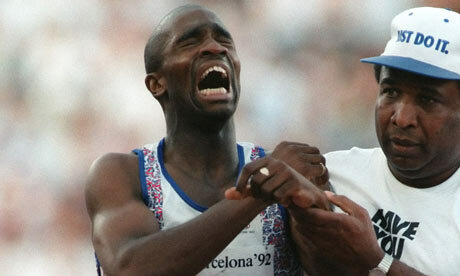 And seeing those moments of athletic brilliance is certaintly enough to bring a tear (or two or seven) to my eye. Some of my favorite moments over the years include: Jason Lezak’s heroic leg in the 4x100m freestyle relay in Beijing, Tessa Virtue and Scott Moir’s free dance in Vancouver (yes, I included ice dancing – deal with it, and trust me that it’s good), and Usain Bolt’s 100m in Beijing. And those are just some (though likely not all) of the reasons I will be getting slightly weepy over the next two weeks. Are you planning to watch the Olympics? And what about them gets to you?